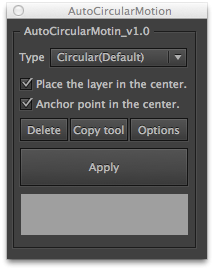 AutoCircularMotion allows you to easily express circular motions. Not to mention linking multiple layers and arranging their movements, you can also set up other motions, such as swinging and bouncing. Having control over Z axis allows you to express the shallowness or depth of movements as well. 1. Select one or multiple layers. Click [ Apply ]. 2. Adjust using ''ACM control'', which will be automatically created. 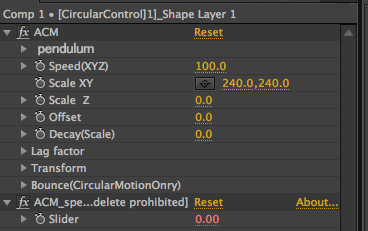 Select a single shape layer which includes a shape group. Then click [Apply] to use this shape group to different layers. Click [ Apply ] after selecting a single layer which [ Trapcode Particular ] has been applied to. This allows you to apply ACM to [ Trapcode Particular ]. You cannot use light or null layers, which ※ACM has been applied to, as an emitter.